The Evans Slip was constructed in 1832 to 1834, and was part of the practically Venetian network of slips and basins at the terminus of the Erie Canal. The channel was located on the north side of the Buffalo River at its mouth, extending to Erie Street, and was about 700 feet long, 60 to 80 feet wide, and 19 feet deep. 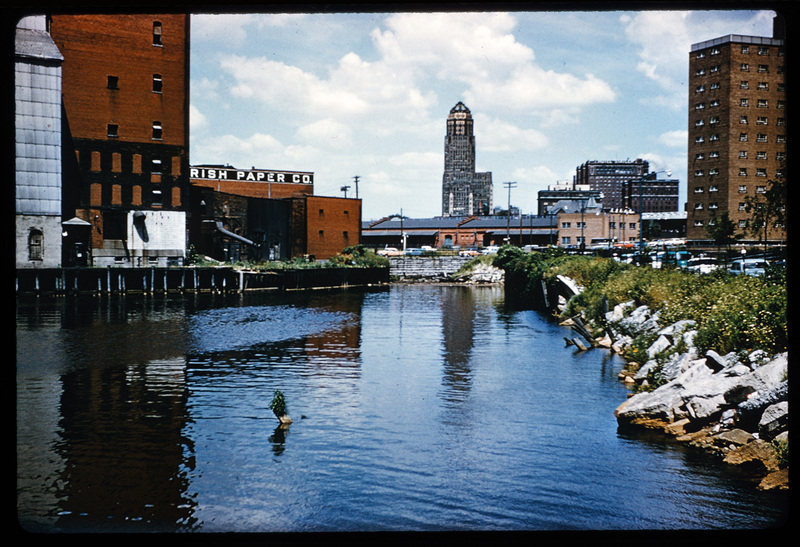 This circa 1958 view of the Evans Slip was taken from an Erie-Lackawanna Railroad swing bridge, built over the slip in 1902. The vacant Thornton & Chester Milling Co.—with mill buildings dating back to 1868—flanks the water on the left at 212 Erie Street. A sign for the George Irish Paper Co. is visible on a building at 21 River Street, across Erie Street. On the right is the Dante Place housing project, completed in 1952 and later renamed to the Marine Drive Apartments. In the distance, Buffalo City Hall terminates the view—coincidentally, perfectly on axis with the Evans Slip. Plans to fill the Evans Slip were discussed as early as 1950. The slip wasn’t popular: One resident, in a letter to the Buffalo Courier Express, said it was “a stagnant cesspool littered with rotted wood, tin cans, old tires, etc., and is infested with rats.” The dilapidated condition of the slip notwithstanding, what the slip did represent was not appreciated at the time—about 1,500 feet of shoreline, all of which would have added value to the adjacent property as development sites. By 1972, the Evans Slip was filled and Erie Street was “un-straightened” and diverted on top of it. Today, it would be difficult to discern that this section of Erie Street was once navigable waters.